I have spent a large amount of time over the last year writing about Japan and the crisis that I believe is coming for their country. For those that need a review on the fundamentals why this crisis will occur, I highly suggest you review the link at the bottom of this page. Whenever I discuss Japan the first question or comment I receive on the topic is "how can an individual investor can profit from the coming crisis?" Today we are going to move beyond the "why" in Japan's coming crisis and look at both how I believe the process will play out and subsequently how investors can both prepare for its arrival and potentially profit from it. The government debt crisis in Japan is going to be different from the crisis we have observed in the European Union over the past 3 years for one very important reason: Japan has a central bank that stands ready with no political hindrance to unleash an unlimited amount of printed money to purchase assets in their capital markets. As a brief review, the opposite has recently occurred in Europe as the yields on the government bonds moved higher as investors knew that their central bank did not have explicit authority to enter capital markets and buy bonds to push yields back lower. This allowed speculators who in many cases have close to an unlimited amount of leveraged purchasing power in markets over the short term, especially through the derivatives market, to push bond yields higher (this is a topic beyond the scope of this discussion). This meant that a hedge fund, or group of hedge funds, could enter the Credit Default Swaps (CDS) in Greece and cause the cost to carry insurance on Greek debt to rise significantly. This would trigger panic in the Greek bond market where they had laced an enormous amount of short positions on their debt. They would then push as hard as they wanted on both markets (shorting both the swaps and the actual debt) to push the markets lower and create a feedback loop. The European Central Bank had to stand back helplessly and watch this occur, and the hedge funds knew this, which is why the crisis began first in Europe - a crisis which has significantly helped Japan as attention was diverted away form their own balance sheet disaster, which we will come back to in a moment. They soon moved pass Greece once the blood was in the water and began attacking the government bond markets in Portugal, Ireland, Italy and Spain. This caused their bond yields to rise and provided speculators with enormous profits. Once again the European Central Bank was forced to sit back and watch helplessly, like a chained junk yard dog that watches the criminals loot the junk site. Please understand that I am not saying that Greek government bonds were, or are today, worth anything close to full value. The same applies to Portugal, Ireland, Spain, and Italy. The speculators would have been correct in shorting the debt on a fundamental basis even if central banks were not part of this discussion. However, some can look at the balance sheet of Spain and clearly see that it is in better shape than the United States and it is certainly in better shape than Japan, which is by far the worst government balance sheet on the planet (and in history). So why were the speculators not attacking the US and Japan with the same technique? Because the watch dogs, the central banks in both these countries, have no leash. If a speculator enters their markets and dares short government bonds they have promised an unlimited amount of printed currency to keep their bond yields lower. The gun is pointed at the front door daring a brave sole to enter. So far in this story no one has. The following shows the 10 year Japanese government bond yield for Japan from March 1990 to March 2013. Yields have fallen from close to 8% to .62% where they stand today. Yes, that is a decimal point on the current yield. Investors today are willing to give the completely bankrupt Japanese government their money for 10 full years at .62% per year. On the opposite side, yet equally important to this story, you have their currency the Japanese yen. 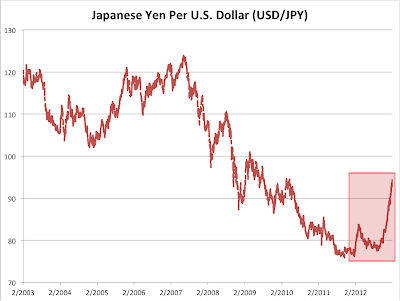 The following chart shows the yen U.S. dollar exchange rate over this same period, March 1990 to March 2013. It has fallen from 160 to 95 where it stands today. So how will this story play out? I believe that in the end both the yen and the government bonds will fall significantly in value. It has been my estimation over the last year that the central bank would focus on devaluing their currency to boost their export market as well as "stand ready" to unleash an unlimited amount of firepower into the bond market in order to keep rates low. This would cause their currency to fall in value before we saw the movement in the bond market (the opposite of what occurred in Europe as the bonds led the currency lower). This is exactly what we have seen take place so far. The problem is that the central bank cannot keep both their currency high and bond yields low. 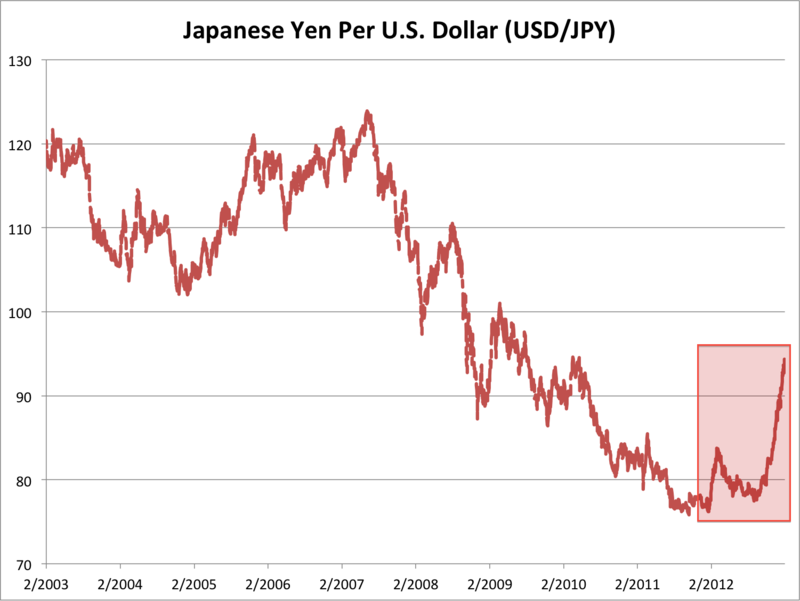 As they create new currency to purchase bonds it creates a surge in the quantity of yen available in the market. Those familiar with basic economics know that all things equal a larger supply ultimately ends with a lower price. Shorting Japanese government bonds has been a losing trade for over 20 years. It has been dubbed "the widow maker" in the investment community. Can the bonds move lower from here? Of course they can. Hypothetically they can move to 0% as the central bank has the ability to purchase every bond on the planet. Hyperinflation would arrive before they had the ability to do that, but it is "hypothetically" possible. My guess is that you will see the currency markets move first (which may already be in the process of happening with the recent 20% decline). Once yields on the Japanese government bonds finally stop falling and then reverse, it is lights out for the bond market as interest expenses will instantly overwhelm all revenue. I am not an investment advisor. Please speak with one before making any investment decisions. WARNING RE: SHORTING JAPANESE BONDS!!! Recall Greece - NOBODY collected on their shorts because the govt simply changed the rules and they didn't call the default a default. And it's not just the governments that can change the laws as they wish. In the case of Greece, the organization that determines whether or not a credit event occurred is ISDA - a privately run trade commission. The people who run the organization are all of the usual suspects - JPM, GS, DB, MS, etc. Contracts such as CDS only pay out when a credit event occurs. The contract specifies that the ISDA is the one who determines whether or not the event occurred. Would you buy insurance from a company who co-manages the agency that determines whether or not they legally must pay you on your claim? And once again, it'd be near impossible to have any legal recourse on this since none of those governments want to help "evil speculators" who "destroyed their great countries" by buying CDS. You make an excellent point, and the ability for governments to change the rules is always something to consider while investing. The scope of this conversation is not for the purpose of investing in derivatives. If you were purely short the interest rates on the Greek government bonds, your investment would have performed excellent. If Greece was its own entity, and not a part of the European Union, you would have seen both a collapse in their currency value as well as their bonds (which I believe is coming for Japan). It was only the strength of the rest of the European Union that kept the currency strong as strong as it stayed. However, to delve into the CDS conversation, remember that the value of the CDS in the open market rose significantly leading up to the moment investors realized that the governments would possibly change the rules. So to go back to Kyle Bass, he began to purchase insurance on Greece back in 2008 (Michael Lewis documents their conversation at that time when he told him that's where he was moving money) and he sold his CDS exposure as everyone else jumped on the trade, long before the discussion entered whether or not the government would allow a "credit event." He told CNBC early in the crisis that he had already moved on to shorting Japan. So he once again made a killing. I am sorry, but I don't follow the conclusion of this article. If the BoJ has unlimited ability to print Yen to support the JGB market, then surely the result will be that yields stay (artificially) low and the currency collapses. So one should short the Yen not JGB. Re: Greece - CDS didn't pay, but if you could get a borrow on an actual Greek bond you could have made a tidy sum. How can retail investors buy JGB CDS insurance contracts? Bonds with maturity of one year to ten years are referred to as intermediate bonds or intermediate notes. The long-term bonds are issued with a maturity of at least ten years and commonly up to 30 years.